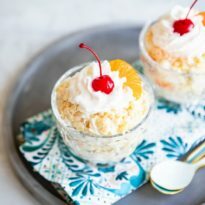 Frog Eye Salad is a a sweet, pudding-based fruit salad that can be made with convenient ingredients or homemade whipping cream, we call it a salad just as an excuse to have two desserts! Sweet, chewy, and decadent, who knew Frogs’ Eyes could taste so good! Cooking for a crowd? Click and slide the number next to ‘servings’ on the recipe card below to adjust the ingredients to match how many you’re serving—the recipe does the math for you, it’s that easy. A staple at picnic potlucks in Utah, Frog Eye salad is a pudding/pasta/fruit salad that is, for lack of a better definition, a dessert salad. 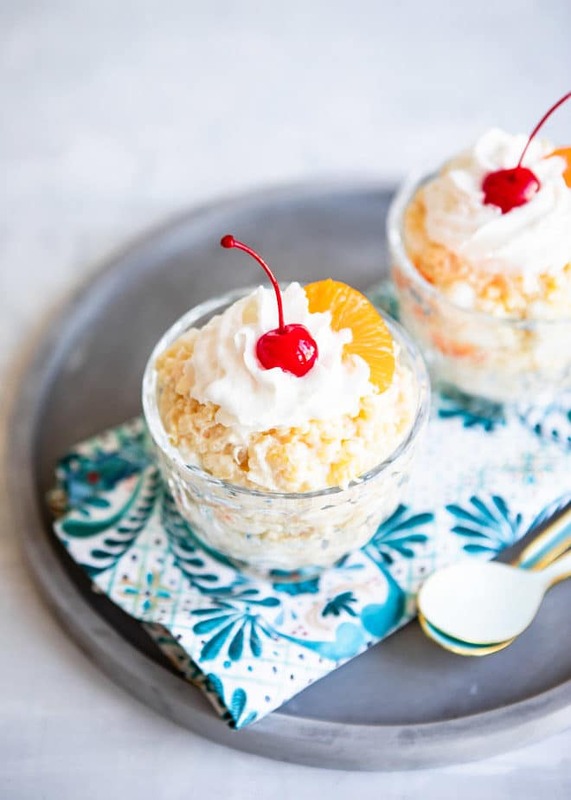 This fruit salad combines acini di pepe pasta, mandarin oranges, and pineapple suspended in homemade pudding and whipped topping, with the addition of marshmallow and shredded coconut for texture. What is acini di pepe? Acini di pepe, meaning ​seeds of a pepper ​in Italian, is similar to the more popular Pastina. It is what gives this dessert salad its overall chewiness and the appearance of a frog’s eye. For the best texture, cook until al dente, about 6 minutes in boiling, salted water and chill immediately. What is a good substitute for acini di pepe? 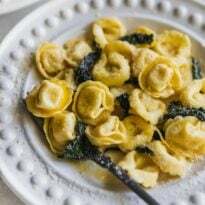 If you can’t find acini di pepe, you can substitute it with another small shaped pasta such as pastina or small stars, Israeli-style couscous, or even tapioca pearls. Keep in mind cooking times may vary. Is custard the same as pudding? Pudding is a dessert with milk or cream thickened by starch, custard is a dessert with milk or cream thickened by egg. Think of custard as pudding’s egg-y cousin. 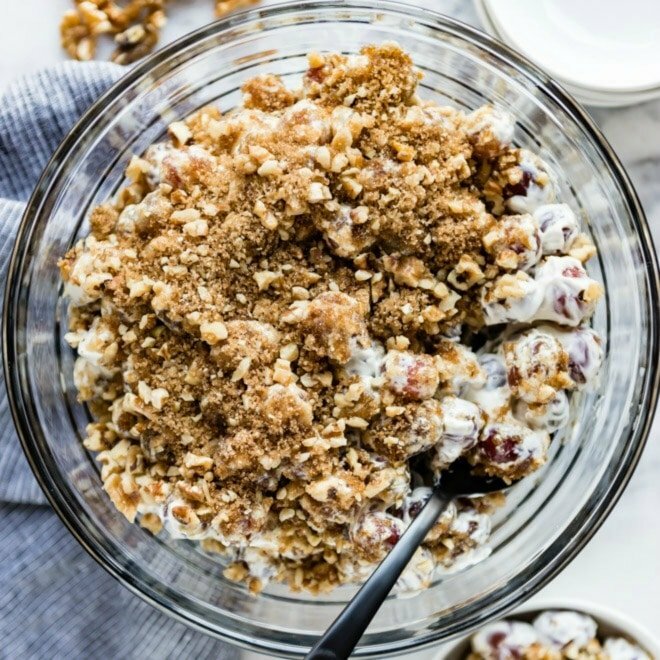 What can I use instead of frozen whipped topping? If you are not a fan of frozen whipped topping, try making your own. In a large bowl, pour in 1 1⁄2 cups heavy whipping cream and whisk until stiff peaks form, making about 3 cups. This equals the same amount of whipped topping found in an 8-ounce carton. Save this Frog Eye Salad to your “Side Dishes” Pinterest board! 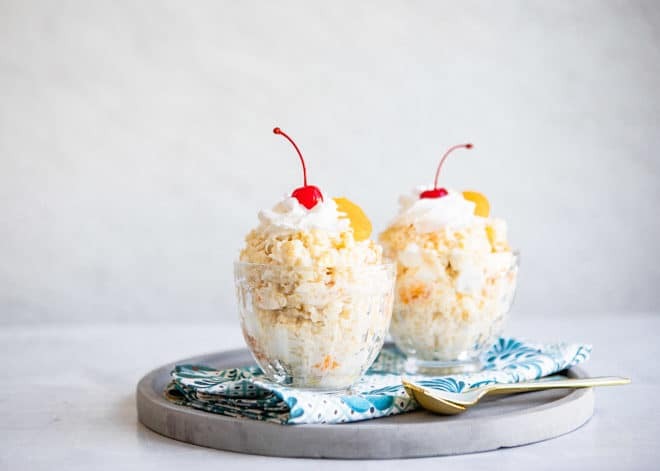 Frog Eye Salad is a a sweet, pudding-based fruit salad that can be made with convenient ingredients or homemade whipping cream, we call it a salad just as an excuse to have two desserts! Sweet, chewy, and decadent, who knew Frogs' Eyes could taste so good! 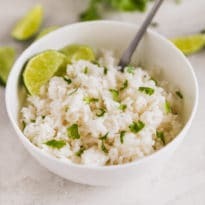 Bring 4 quarts water and 1 tablespoon salt to boil. Add pasta and cook until al dente, about 6 minutes. Drain well and rinse under cold water. Meanwhile, in a medium saucepan over medium heat, whisk together sugar, flour, 1/2 teaspoon salt, pineapple juice, and eggs. Cook until thickened, stirring occasionally, about 10 minutes. Remove from heat, add lemon juice, cover, and chill at least 30 minutes. 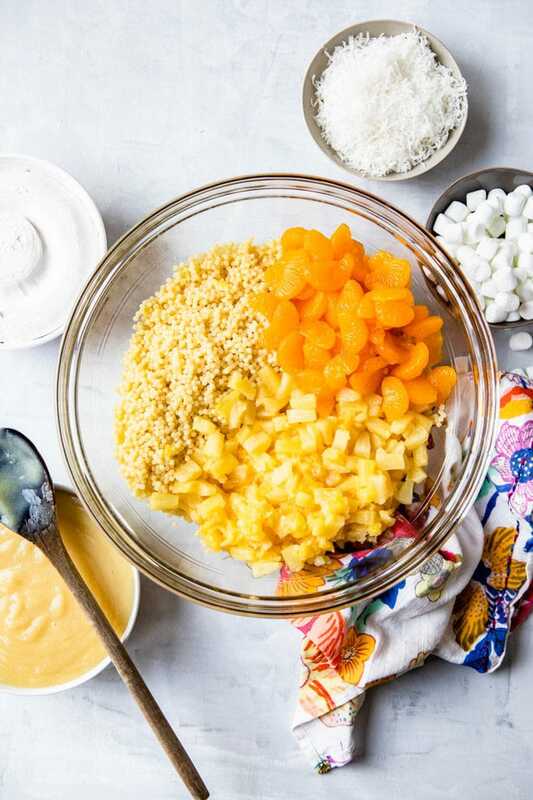 In a large bowl, combine the pasta, custard, mandarin oranges, pineapple, and whipped topping. Mix well and refrigerate at least 30 minutes or overnight. 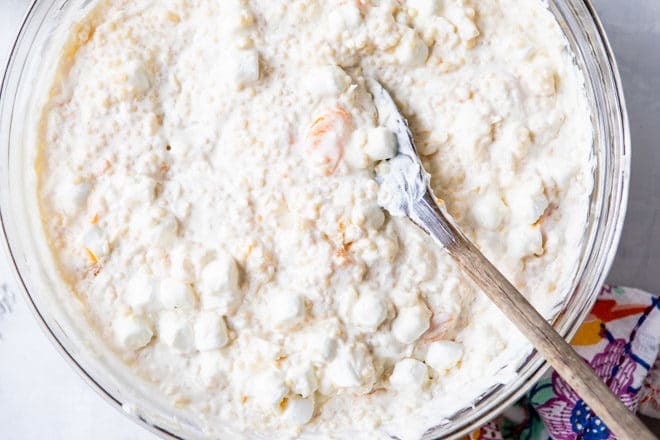 Before serving, add marshmallows and coconut and toss to combine.